By the start of your puppy's second month he will have come a long way from the helpless infant he was just five short weeks ago. Of course he's still a tiny (and absolutely adorable) baby, but now he can eat soft food, lap water, run, play, bark, growl and generally behave just like a puppy! During the first six months of life, your pup will go through an incredible number of stages and changes, and these months lay the foundations for his behaviors, attitudes and social interactions as an adult. Towards the end of the second month is when your puppy is most likely to leave his doggie momma and siblings and move into his forever home with a new family. This is just one of the big changes that happen to your Rascal between weeks 5 and 9, it's a month where it's all 'go-go-go'. A puppy's first year is a melting pot of different developmental 'Periods'. Each one is important and affects how your little one will behave as an adult dog. Your puppy's second month is also the second month of the Imprinting Period and the beginning of the First Socialization Period. As I said earlier.... Go! Go! Go! Starts to be less self-absorbed and starts to take in, and explore, the big, wide world around him. His brain is primed for learning and like the proverbial 'sponge' he soaks up every experience and interaction, constantly trying to figure out how things work and where he fits into his world. Weeks five through nine are when Rascal learns what it means to be a dog, and how to interact with other dogs in an acceptable way. He also learns how to interact with people. And he learns all of this from his momma - which is just one of the reasons why it's so important to choose a puppy carefully, and pay attention to the health and temperament of his 'real' mom. The Fear Period doesn't last long (often just a week or two) but it's an important part of this month's development and helps move him towards independence and build self-confidence. Most veterinarians and researchers believe that during your puppy's second month, his natural immunity begins to decrease. Up until now he's been fairly well protected from disease by the maternal antibodies he got from his momma's milk. And also by having limited exposure to other dogs, pets, people and places. By the end of your puppy's second month he will probably be living with his forever family in a new environment. This exposes him to viruses, bacteria and parasites that could make him sick, including the biggest threats to young puppies - Parvovirus, Coccidiosis and Giardia. Plus the hugely common intestinal worms. * Be sure to ask the breeder/original owner for proof of vaccinations & deworming treatments. If your pup hasn't had either/both, then it's something you're going to need to get taken care of asap. For most of your puppy's second month he NEEDS to be with his momma and litter mates. Your pup instinctively copies his momma's behavior and reactions and this is how he learns how to relate to, and interact with, other dogs, pets and (importantly) people. 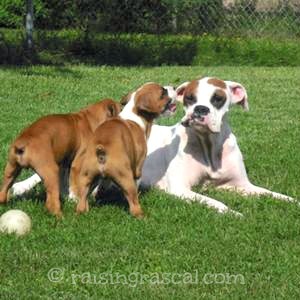 There are also another important lesson which Rascal learns from his momma and littermates. It's called 'Bite Inhibition' and it's important! Through trial and error, he learns that he can only bite/nip his siblings or parents just-so hard before there are consequences that he doesn't like - this is called 'bite-inhibition' and it's a very important lesson! If he's taken away from his canine family too early (before 8 weeks) Rascal won't get a chance to learn all these lessons properly and his new human family will have to try to play catch-up later on. Although your little Rascal is going to be a very busy little puppy during this stage, he also needs lots of sleep. He'll be very active, but in short bursts, followed by a nap.... and this cycle will be repeated over and over again, all day. It's totally normal. For the majority of your puppy's second month he is going to be with his doggie family in his original home. So, most of the human responsibility for his care continues to fall on his breeder/first owner. 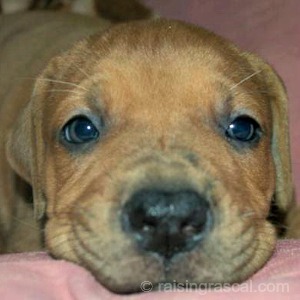 But by the eighth or ninth week your puppy will most likely be moving to his 'forever home' with his new family. That means there are definitely some new owner responsibilities in these last couple of weeks as well. Making sure puppies get vaccinated and de-wormed before they go to their forever home. 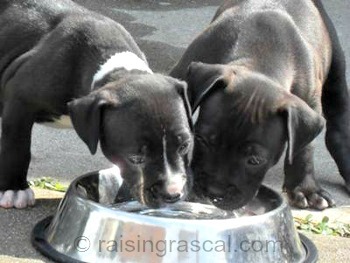 Weaning them at the right time, and replacing momma's milk with a premium puppy food and giving them water to drink. Beware of breeder/owners who try to sell a puppy of less than 8 weeks old (often much younger) because they say 'the momma dog has stopped feeding them so they're ready to go'. 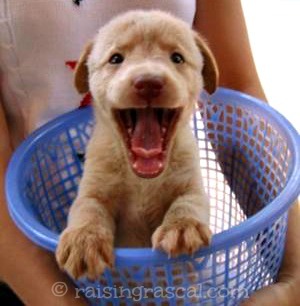 Dogs begin to wean their puppies naturally somewhere between the 3 and 5 week mark. This is when the breeder/owner needs to step in and provide a nutritional puppy food and water to drink. Some unscrupulous owners don't want to invest time and money doing this because they're only interested in the $$$'s the puppies bring in. This is not the type of person you want to get your new puppy from. Once little Rascal has left his very first home and come into yours, he is totally dependent upon you. All of this is now up to you. This is a normal developmental stage that begins during your puppy's second month. If Rascal suddenly seems afraid or anxious around people, places or objects that he's been fine with up until now, then you know he's reached that phase. Don't molly-coddle him, but don't push him to do things which scare him (this could have long-term negative effects). Be upbeat and loving and he'll soon regain his confidence.